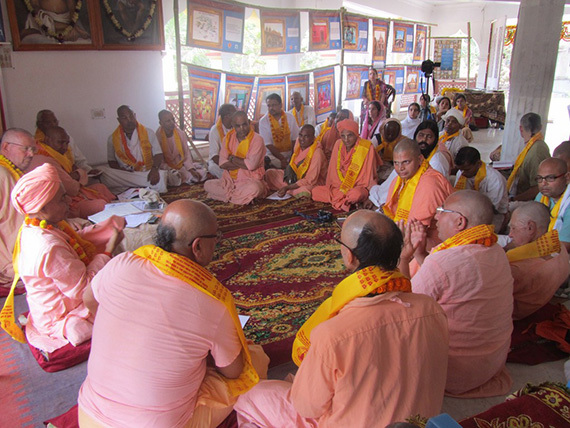 The last meeting of the World Vaishnava Association took place in March at the sacred Samadhi Mandir of Srila B.P. 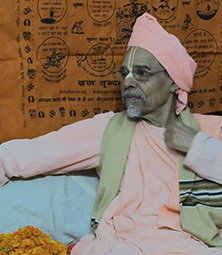 Puri Goswami Maharaja in Mayapur, India. The meeting was inaugurated by the Executive Chairman of the WVA-VVRS and Acarya of Sri Devananda Gaudiya Math, Srila Bhaktivedanta Paryatok Maharaja. After glorifying Sri Guru Gauranga Radha Vinod Vihariji, Srila Maharaja highlighted the importance of the Vishva Vaishnava Raj Sabha established by Srila Jiva Goswami, as a group concerned souls spreading the glories of Sri Caitanya Mahaprabhu all over the world. This knowledge must be shared with everyone, and to unite strengths Srila Jiva Goswami established the Sri Vishva Vaishnava Raj Sabha. This is the WVA's and the Gaudiyas Math's goal. To preach the glories of Sri Caitanyadev will bring the blessings of Mahaprabhu and Radha-Krishna." – The impact of using plastic in our maths, and how to replace plastic with alternative solutions. – The creation of a WVA Trust that may collect donations and funds in order to improve projects realized by the sabha. 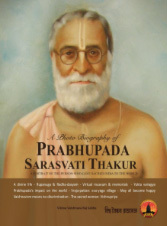 – The release of the new and important publications to expand the glories of Srila Bhaktisiddhanta Sarasvati Thakur Prabhupada: "The Photo-Biography" printed in magazine format and the "Srila Bhaktisiddhanta's Museum" as an exposition of pictures that tell about his life and work. – The fortification of the Publication's Committee of the WVA. – The publication of vaishnava news on the newspaper "Caitanya Mail", distributed in Bengali and English through all West Bengal. – The assembled representatives from different missions associated with the WVA agreed that only raw materials from naturally dead cows should be used "ahimsa mridangas". – Discussion about WVA's opinion on the delivery of the siddha-deha pranali diksa by certain line of babajis from Radha Kunda. – New projects of the Education Committee. – The importance of the presence of the WVA in the society and the upcoming events that enable it. 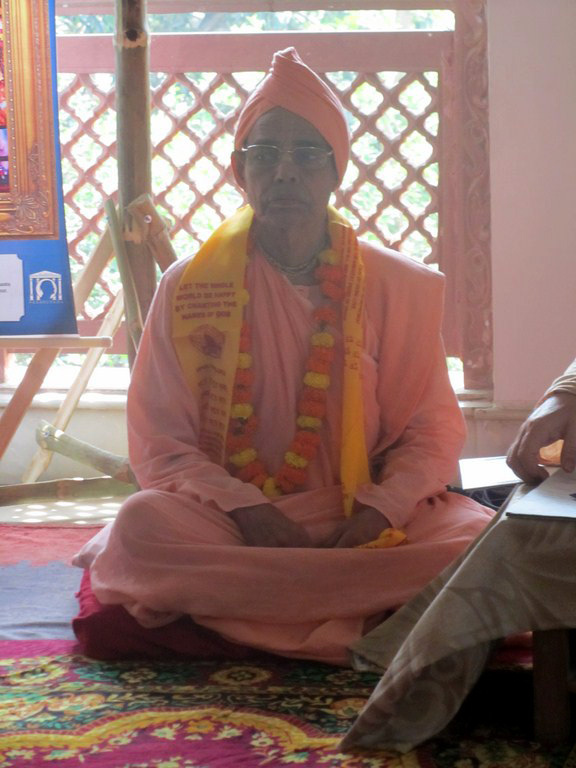 – The next general assembly of the WVA will take place on the 19th of October, 2014, in Vrindavan. The place will be previously confirmed. 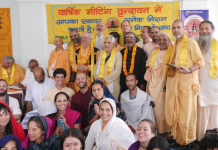 – A health clinic will be developed and a school established by the WVA for children in Mayapur Dham with the support of the Sree Caitanya Gaudiya Math. 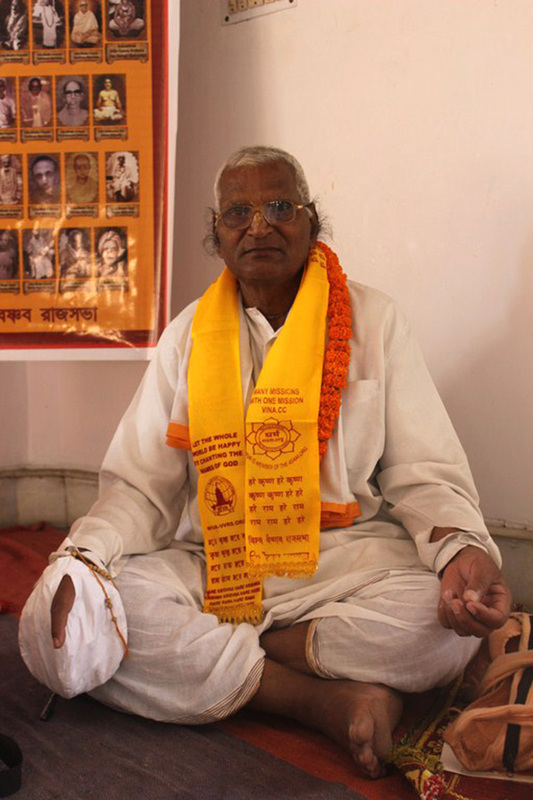 – Sripad Om Prakash Brijwasi prabhu offers Hindi lessons to all interested devotees. 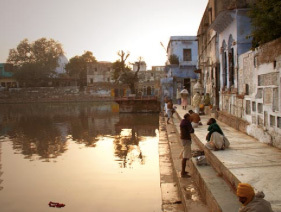 The seminaries will take place in Yamuna Kunja, Vrindavan. 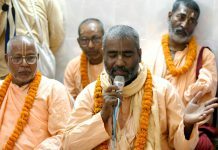 – New members of the committee: Sripad Bhakti Ratna Sadhu Maharaja, Sripad Bhakti Nandan Swami Maharaja, Sripad Radha Madhav Das, Sripad Rajib Chakravarty. – The committee will be in charge of publishing important books of our sampradaya and also to organize translations in different languages. – A list was presented of all printed and digitized materials produced by the WVA-VVRS in the past 20 years as a service done for mankind. 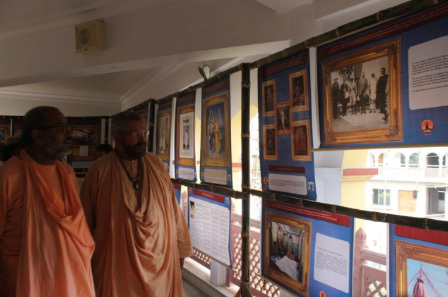 – Srila Bhaktisiddhanta Saraswati Thakur Prabhupada's Museum was presented by displaying a collection of 108 printed graphics that depict the most important moments of Srila Prabhupada's history and his legacy to the world. Hundreds of vaishnavas attended the exhibition and everybody appreciated this effort for the expansion of the glories of Srila Prabhupada. The museum's collection is also available on DVD, which includes a historical narrative for each graphic. – New material also released during Gaura Purnima 2014 was the Photo-Biography of Srila Prabhupada Bhaktisiddhanta, a project developed by the Publications Committee of the WVA with the Vrinda Kunja team in Vrindavan. 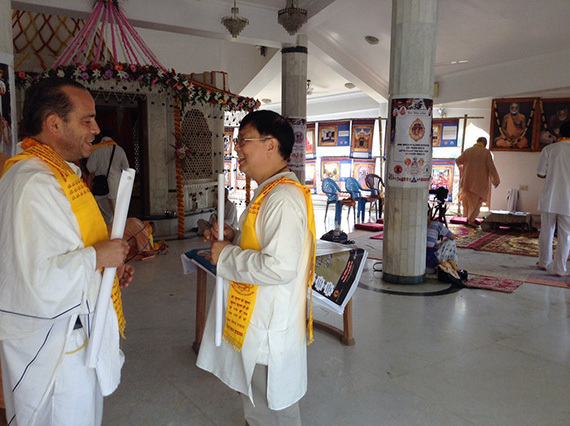 – New members of the committee: Sripad Ananga Mohan Das and Sripad Radha Madhav Das. – In November the World Hindu Congress will take place in Delhi. The participation of the WVA at this congress is very important. 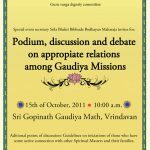 Those interested please contact Sripad Bhakti Vichar Vishnu Maharaja from Sri Caitanya Gaudiya Math. 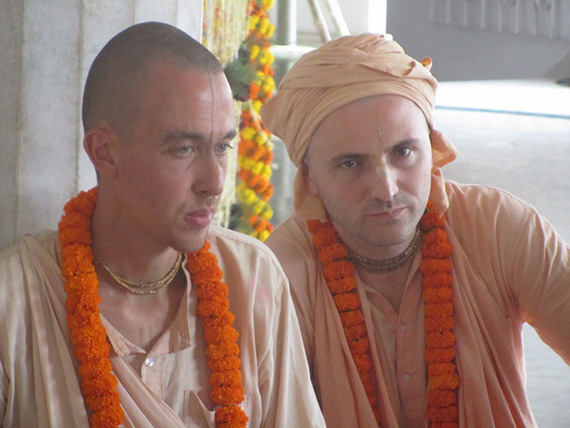 – Bhaktivedanta Charity Trust is repairing some buildings in Mayapur. They are in charge of the care of a few buildings of our gaudiya sampradaya. In the WVA meeting held on the 30th of October, 2013, at Srila Bon Maharaja's bhajan kutir (see report here), the assembly approved the initiative to completely eliminate the use of plastic plates and cups in our maths, mainly during special festivals and vaishnavas events. The point is that, even though it is a decision of all maths, many of them still utilize these elements that are very harmful. Srila B.B. 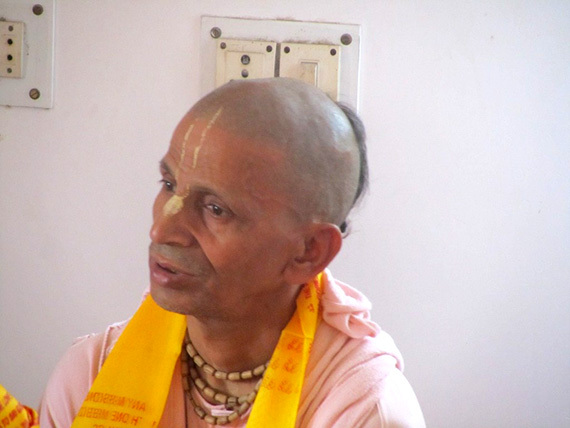 Bodhayan Maharaj confirmed the danger posed by plastic pointing out that the garbage and the plastic of our cities contaminate even the water: "This is not positive for health and it is converted in a critical topic for the future. We must completely stop the use of plastic. In other countries they make big investments to utilize only recycled plastics, but here, in India, we don't do it. The cities has become really dirty because of the plastics. I ask Rajib Chakravarti to please publish an article in the newspaper about the horrible effects of plastic." 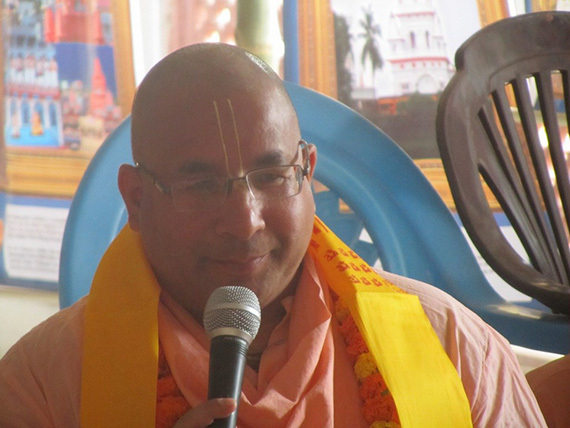 On the other hand, Sripad Arup Govinda Das confirmed that many maths in Mayapur Dham, such as Sri Bhagavat Math, Sri Krishna Caitanya Math and Sri Gopinath Gaudiya Math, has completely stopped the use of plastic. Sripad Bhakti Nandan Swami Maharaja fully supported the initiative, confirming that we not only have to eliminate the use of plastic plates and cups, but also the polyethylene bags. 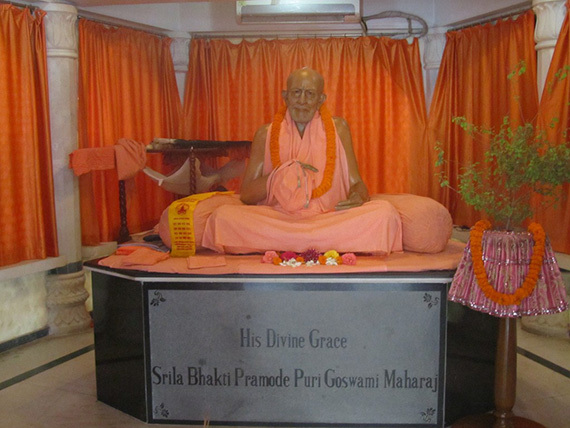 Srila B.A. Paramadvaiti Maharaja added that "we must become more aware of the use of the products we use in our worship to the Lord, we need to know about GMO, the impact of plastic, oils harmful to health etc. There are many connected topic that require awareness from our part." Sripad Ananga Mohan Das from Keshavaji Gaudiya Math gave a complete and scientific description over the impact of plastics, proposing to the assembly the use of paper plates for the festivals. All confirmed the proposal. Prabhu suggested that also the WVA publications could be made in different materials, not only in plastic. The WVA cleaning department in Sridham Mayapur asked all present members on the assembly to please keep the garbage of their temples in the corresponding containers that have been placed on strategic sites, inside the mandir and along the Bhaktisiddhanta Road. The cleaning team takes the garbage away from the temples every two days and asks the vaishnavas to keep Sri Mayapur Dham clean and beautiful. The devotees may also participate by supporting more workers. This is an issue that we must address all together. 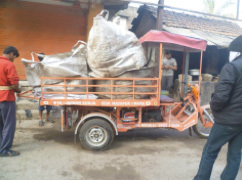 The temples are committed to take the garbage off the corresponding containers and then the cleaning team take it away to the city's dumping ground that has been kept by ISKCON. The Environmental Committee has been responsible for making a strong campaign of environmental education in Sri Vrindavan and Sri Mayapur Dham. Sripad Vishvarupa Das from Colombia has designed some very beautiful posters in English, Hindi and Bengali that are been glued all over the Dham. Along with it, the theatrical team of Vrinda Kunja has presented the play "Our Last Chance" in many schools and rural communities of Delhi, Rishikesh, Braj Mandal and Goura Mandal, to expand the urgent need of protection of the holy rivers and holy places of pilgrimage. Sripad Bhakti Ratna Sadhu Maharaj could not be physically present on the meeting, but in previous days made the proposal to the WVA-VVRS of starting a legalized Trust that allows the WVA to collect funds and donations in aid of the different services of vaishnavas and holy dhams. Sripad Bhakti Vichar Vishnu Maharaja from Sri Caitanya Gaudiya Math will be the leader of this new Foundation. In this way, all those vaishnavas and friends that want to participate by funding a WVA projects, may do so through donations. A few of the projects of this future Trust are: to publish books of our vaishnava grantha, to organize preaching festivals with vaishnava leaders, to support temple restoration linked to the gaudiya sampradayas, to make educational campaigns, to promote the cleaning of the Dham and against the use of plastics, spreading the glories of Srila Bhaktisiddhanta and his mission around India and the world, and many more. This committee will be supported by the involvement of Sripad Bhakti Ratna Sadhu Maharaja who offered to actively participate in the printing of important books of our sampradaya. Sripad Radha Madhav Das, who published a complete thesis about Acintya bedhavedha tattwa, will also be an active part of this committee. The publications will be financed from the funds collected by the Trust. The Publication Committee will also encourage the translation of literatures to different lenguages: Hindi, Bengali, Oriya and English. 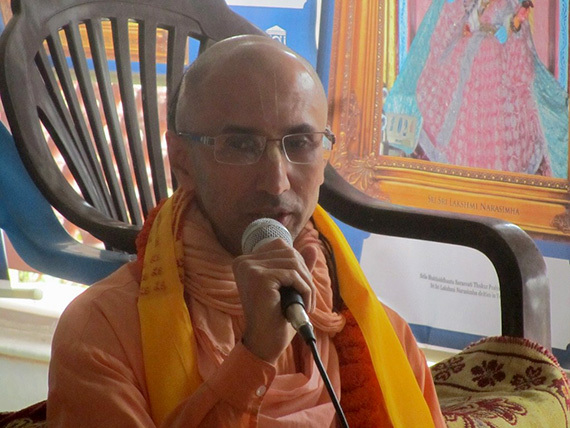 Rajib Chakravarty develops a monthly newspaper in Bangla and English that publishes actual news from India along with important topics and news of the vaishnava tradition. It was introduced and presented to the assembly, putting it at the service of the WVA. "We publish religious topics and from the Bhagavat Dharma together with other social issues of the country so people can know what is currently happening and also see the example of the sadhus and so follow it", said Rajib Chakravarty. 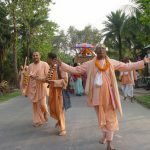 The assembly organized to monthly acquire 1000 copies of the newspaper to be distributed in Mayapur while supporting the financing of certain advertisements within it. One requirement was that the topics discussed in the meetings of the WVA will be published in the newspaper itself. The invitation was extended to all those who want to participate in the Publication Committee and in the Internet Committee to share vaishnava news. 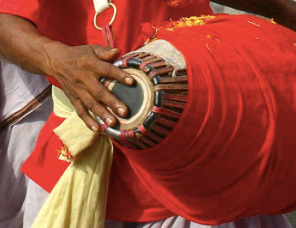 The following question was posed to the assembly: "Is there any karmic reaction for using musical instruments and mridangas, in special, in which materials come from the mistreatment of cows?". The present sadhus answered this question based on the vedic scriptures and also gave their proposals to resolve the issue. The conclusion was synthesized by Sripad Bhakti Nandan Swami Maharaja: "We must completely eliminate the use of mridangas that are not ahimsa (whose raw materials are not from naturally dead cows), otherwise, we become directly responsible and we accumulate the reactions of the case". 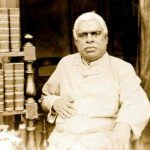 Sripad Bhakti Prasun Madhusudhan Maharaja said that he has contacts with different gosalas in Braj Mandal that may provide raw ahimsa material, but that someone must take the responsibility to organize it. To close the topic, Sripad Ananga Mohan Das gave a complete and shocking discourse over the importance of cow protection and the proper way to do it, considering the appropriate extraction of milk and other products that go mata offers. Srila Bhakti Alok Paramadvaiti Maharaja adds that: "We are responsible for destroying our own vedic tradition. If we do not use milk products from protected gosalas, then we are guilty of mother cow's exploitation". This topic became part of the environmental committee which Ananga Mohan Das and Sripad Sripad Radha Madhav Das became new members. 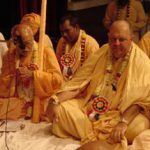 What is the vision of the Gaudiya Math over the re-initiations given by the babajis of Radha Kunda to devotees that had already being initiated in our parampara? Should the WVA-VVRS do something about it? 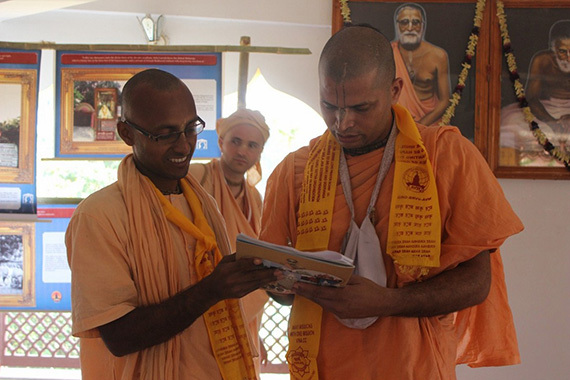 Sripad Madhusudhan Maharaja gave an example in which a foreign devotee was initiated in the siddha deha pranali diksa twice by the same person, removing value and veracity of this process, : "There are many points to consider, i speak about this issue in every class to teach the difference between the two." 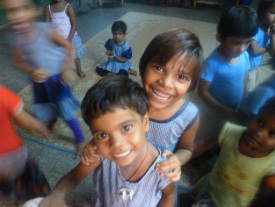 The WVA-VVRS started an initiative to develop a school for children in Sridham Mayapur. Sripad Bhakti Vichar Vishnu Maharaja of Sri Caitanya Gaudiya Math will support this project. 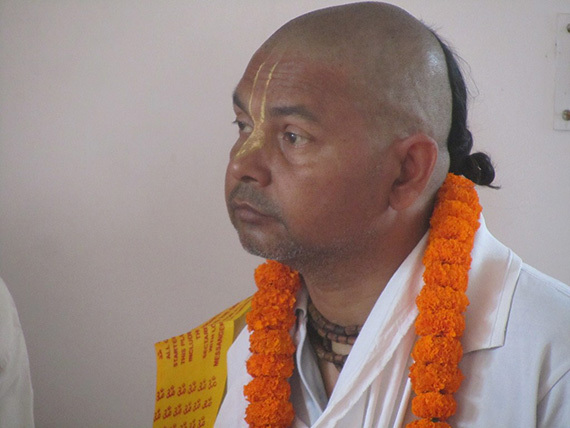 Sripad Bhagirath prabhu, from Jahnavi Kunja Gaudiya Math, will take charge together with his wife Anandamayi Dasi. 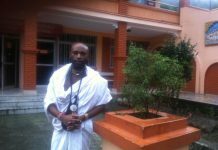 Prabhu will also be in charge of the WVA clinic at the same place, wherein he may not only receive and attend patients with health problems, but also educate them about the vaishnava teachings and about the importance of protecting the dham and to keep it clean. 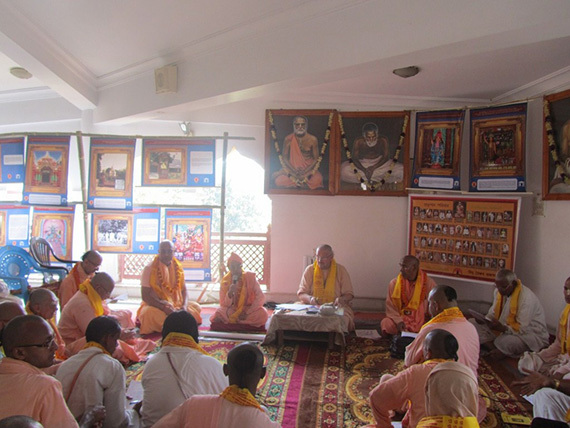 The last topic discussed at this meeting was the importance of team work with different participants of the WVA-VVRS, by creating a sadhu-sanga group with a common goal. "Very powerful decisions have descended to us by Sri Caitanya Mahaprabhu and the Guru parampara, and if we keep united, we will be strong enough to keep expanding. The WVA-VVRS must become an element with social impact, so the teachings of Sri Caitanya that all Gaudiya Maths promote may have a bigger impact. For example, there are important situations such as protecting and cleaning the dham, cow protection, and other issues, where the WVA-VVRS may be presented to the authorities and request changes; but for that it needs to strengthen the unity of it's members. A board of sadhus is essential in today's society. In vedic times the sadhus were the King's counsellors. Nowadays there are no kings anymore, but a government that accomplishes the same function. All that is required is a bit of energy, but in essence it is what we must do. There is no need to talk about our sadhana because this is already part of our life, but we do need urgently to talk about our position in society", said Srila B.A. Paramadvaiti Swami Maharaja. Sripad Madhusudhan Maharaja supported the initiative saying that the WVA-VVRS must identify the important issues where action is required, for example against the selling of non-vegetarian products in the dham etc. 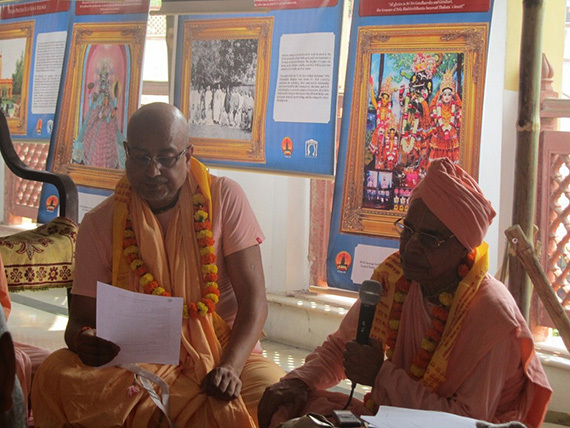 "We must organize a system to recollect signatures in different vaishnava festivals and then approach the government". The assistants supported the need for the WVA-VVRS to become more active on these issues. The importance of participation in the next World Congress of Hinduism between 21st and 23rd of November 2014 in Delhi, India was mentioned. Srila Paramadvaiti Maharaja will make all inquires about it and ensure the participation of the sabha in the event. Previous articleCan the Guru Make Mistakes? Next articleEngaged Vaishnavism: Are Devotees of Krishna Concerned with Making the World a Better Place?